First, I just want to say thank you to everyone who has posted helps for others! By reading through past posts, I figured out how to create a hamburger menu, have a "desktop/large screen" slideshow with landscape orientated photos, and have a "mobile/small screen" slideshow with portrait orientated photos. I just can't figure out some final tweaks. This should take care of both. 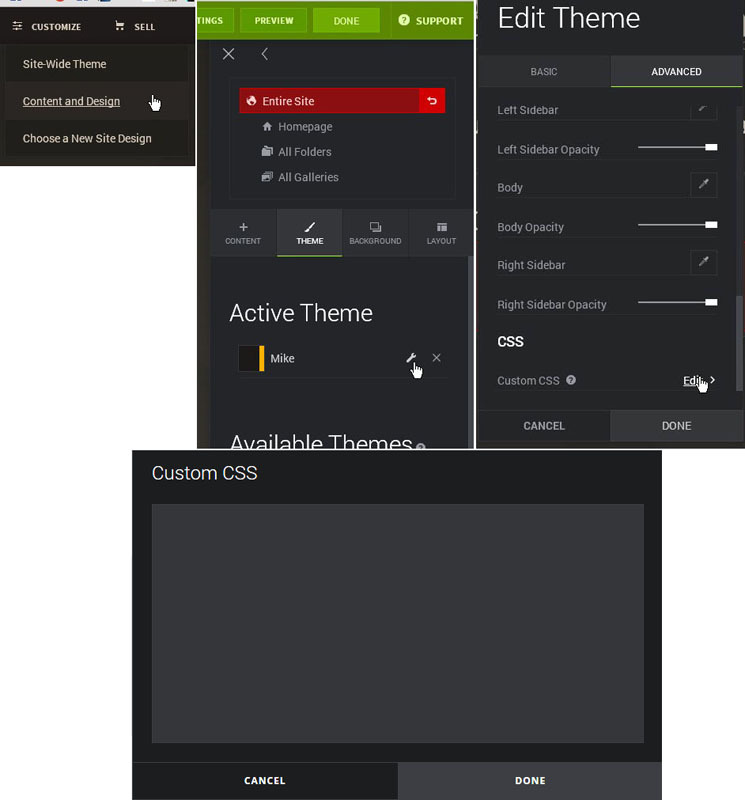 Add this to your Theme's Custom CSS section. Thank you so much! I didn’t even realize there was another place for .css besides the custom .css element I could add to the Entire Site (or each page.) I compiled all the .css to that one space, and deleted all of the separate elements. The separate landing page is now working with only 1 logo. But there is still a gap between the logo and the slideshow on the mobile homepage. I'll attach a screenshot. It seems like there is an element there (672x32) that could be removed? No need for that. I can see (and edit it) using Firefox web tools. That's also why I asked you to add it to your theme's custom section. Easy for me (and others) to see and edit. Oops! I must have accidentally deleted that line when I added the "Hides Header on Insta". Thank you! Margin fixed! So... I clicked on your siggy link "My SmugMug Customizations" and there are so many cool things in there! I found the "Off Canvas Navigation Menu" and I love how it works so much more than how the regular hamburger/menu was working for mobile. I want that to only show up on mobile, and to have the regular horizontal menu links on larger screens. For now, I added the html only to my separate landing page while I am figuring out how it all works. (http://tiffanykeetch.smugmug.com/insta) But after that I'd like to add it to both the entire site menu and my separate homepage menu. 2- How can I get it to be hidden on larger screens? 3- How can I move the hamburger icon up to the right corner of the screen? 4- How can I change the hamburger icon color to #99cccc? Thank you SO much for your help!! I feel like I should compensate you for your time! 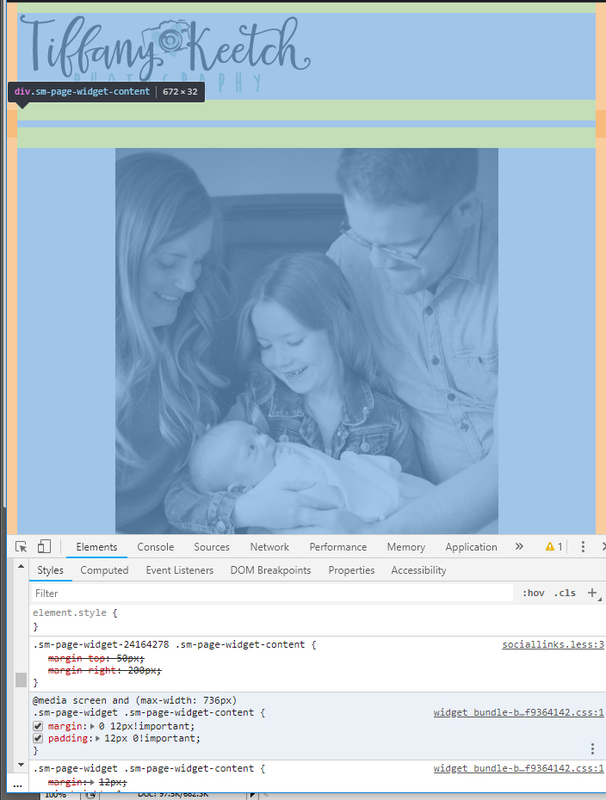 Move the HTML/CSS block that contains that menu ABOVE your Instagram Logo. Then click on the "triangle" for your Instagram Logo. Edit the top margin to a negative number to pull the logo up. Also, change the width from 100% to 50%. Save. That should do it. I think you are. I don't understand the need for a separate Instagram landing page. What does it do? I agree. Everything was too complicated. I deleted all of the menus but two. I have the Smugmug Nav Menu on the Entire Site for large screens, as well as an HTML Off Canvas Navigation Menu for mobile screens. An instagram landing page is for adding direct links to blog posts, or items for sale that I mention on my instagram account - so visitors don't have to spend time searching my site for them. When I post something about a blog post, I can just caption it with "Click the link in my bio!" and there is the direct link waiting for them. I was thinking I didn't want it to seem like they were on my website until they clicked on a link... but that was silly, and so I am fine with all the headers, footers, etc. being the same as the entire site. 6. In desktop view - the Off Canvas Navigation Hamburger Menu shows in the top right of the screen. How can I hide this? In mobile view - how can I better line up the logo and the hamburger menu icon? The closer to the top, the better. I adjusted them so they look great in desktop, so I don't know how to move them for mobile without messing up the desktop view.